Is it really a man’s world when it comes to software engineering? Glancing around a Java uni lecture or checking out the engineering department at an old school software house might feel like you’ve just stepped into a secret men’s club. But don’t be fooled. This isn’t a disadvantage; in fact, it’s just the opposite. By making strategic moves in your career, you can use your scarcity to climb the ladder and help orchestrate more diversity in your own teams. 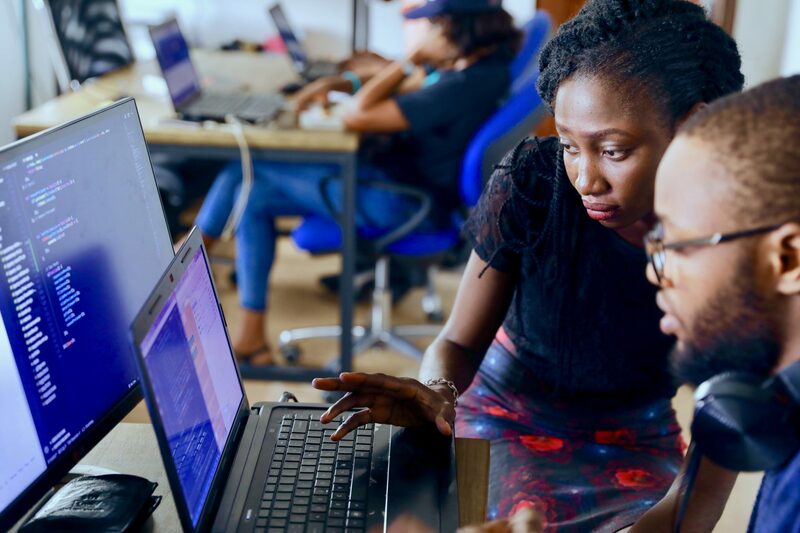 We spoke to three leading women in tech – Nicola Eade, Frontend Developer at Open Agent, Liz Crawford, Chief Product and Technology Officer at Flare HR, and Aisha Khan Information Analyst at EY – for their take on excelling as a woman in software engineering. In your career, simply by being a woman, people may assume that you are better at soft skills by default. This may or may not be true – only you know your own strengths and weaknesses. Honing these soft skills as another tool in your software engineering toolkit is just as important as learning useful frameworks. Now, more than ever, we see a push for diversity in the workplace, something females in STEM (and their clever male counterparts) have worked hard to achieve. “I’ve been working, alongside many others, to improve diversity in tech my whole career. We have seen a lot of progress despite it being slow-going in some ways,” says Liz Crawford at Flare HR. We’ve mentioned before that a staggering 87% of companies have diversity and inclusion as a key value within their organisation (according to PwC’s 2017 Global Diversity & Inclusion Survey) and that some companies, such as EY, even have mandated gender diversity initiatives (yes, up to 50/50 split). It’s clear that businesses are committed to attracting more women into non-traditional roles, which makes you well poised to pounce on career opportunities. Use workplace diversity initiatives to your advantage. While a job opportunity may sound amazing (travel perks, flexible working hours, $$$ salary, oh my! ), without the right crew around you it can quickly lead to dissatisfaction. Would you rather two months of holidays a year, or to be spending your work days alongside an awesome team who inspire you? The software tech du jour of 2019 isn’t what it was five years ago. With technology developing at such a rapid pace, you need to keep your finger on the pulse and continue your personal development by way of learning new technologies. The C systems programmer from 2005 who didn’t learn new technologies is stuck working on legacy code in a just-as-old-in-the-tooth organisation. “More learning?”, you might ask? That’s a yes. While some organisations invest resources (read: work time and/or course expenses) into your continued learning, this isn’t a given – so it’s up to you. There will be some instances in your career path when a curveball gets thrown your way. Maybe it’s the chance to work in a different city or department for a few months. Maybe it’s another company scouting you for a new role out of the blue. Although you might feel like these unexpected opportunities aren’t exactly what you want to be doing right now, they can lead you down exciting paths. Forget your reservations and go for it. Conversely, if you aren’t getting opportunities thrown your way, it’s time to make them happen. Go to networking events, even if they aren’t exactly in your field. Work on a friend’s stupid app or website idea they’ve been bugging you about. Apply for jobs and go for interviews even if you’re happy where you are. Getting out of your comfort zone is when you grow. If you do find yourself in a team or under management that you feel is sexist, then make sure to make your uncomfortableness heard. Speak one on one to the people you feel are the crux of the issue, have a word to teammates or others in the department who would listen to your views, bring it up in meetings, or at lunch, and speak to HR if behaviours don’t change or are seriously out of line. A word about HR: It’s their job to ensure that you feel comfortable as a woman at work. If the culture within your workplace isn’t changing, this is a serious issue. If sexist views or behaviours persist, it’s up to you to go to HR (preferably with an advocate) and demand change or a resolution. Finally, don’t let imposter syndrome tell you that you’re not good enough to make it, that you’re a mediocre developer, or that this won’t work because you’re a woman in a man’s world. This sort of negative thinking is a common mistake we can make as female software engineers – and it can hold us back from progressing in our careers. If you feel yourself with negative self-thoughts in the back of your head or constantly arising, mindfulness techniques can help. Khan suggests turning to Edx and udemy to learn more: “These websites are good sources to help you learn and keep up to date with current trending skills.” Others include w3schools and CodeAcademy, or even the Code Like a Girl blog. For an aggregator of resources specifically for women in tech, you can check out She’s Coding. Sure, it’s not too difficult to network when you’re at work, but how can you find other like-minded people to chat to? There are plenty of avenues for networking face-to-face: conferences, MeetUps (like Sydney’s Code Like a Girl and Women Who Code gatherings for women in tech, alongside non-gender-specific meetups), hackathons, and even asking people on LinkedIn for a coffee to pick their brains. Her personal faves? @womenintech and @womenwhocode, but get browsing on Instagram for a rabbit hole of community-building and don’t forget to check out conference accounts from around the world. For a flourishing software engineering career is a wonderful place to start (or continue!). With diversity a key factor in many companies hiring considerations (as well as in their management opportunities), the ladder is there for the climbing. Ready to step into a new role, or see what’s on offer? We have listings from the cream of Australian big business and exciting startups – companies who know your worth and want you on board right now. Check them out!